If you haven't heard of mycorrhizae (myco), beneficial fungi, microbes or beneficial bacteria then you might be missing out. In a teaspoon of soil there are more bacteria and fungi than all of the people on earth. Most plants couldn't live without them. 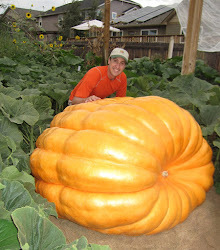 By building biology in your soil with a healthy balance of beneficial bacteria and fungi you can grow bigger pumpkins, healthier lawns and have a better garden. One of the better known beneficial fungi is called mycorrhizal fungi. These microscopic guys can produce a symbiotic relationship with the roots of your plant and as a result bring extra water and phosphorous to your plant. You could literally double what the roots alone could do with myco. What many growers don't know is that it can take a month or so for your myco to mature to the point that they are providing much benefit to the plant. One prominent myco producer somewhat quietly once told me that there may be some benefit in starting myco in pots three to four weeks prior to your planting of your actual plants. Because of this, each year I start a test planting with a couple of seeds in a pot that I have pre-added myco and other beneficial bacteria to. In two more weeks, when I start my pumpkin seeds, I'll pull these plants out of their pots and mix the soil from this pots in my pumpkin pots. This year I used NPK Industries' RAW Microbes Grow Stage. It has four different types of myco along with five different types of beneficial bacteria. One of the reasons I'm using RAW Microbes is because if you were to test some of the different popular products on the market you would find that in some cases the spores aren't viable or you aren't buying what is on the label. NPK Industries double tests their product. Let me know if you are interested in this product.